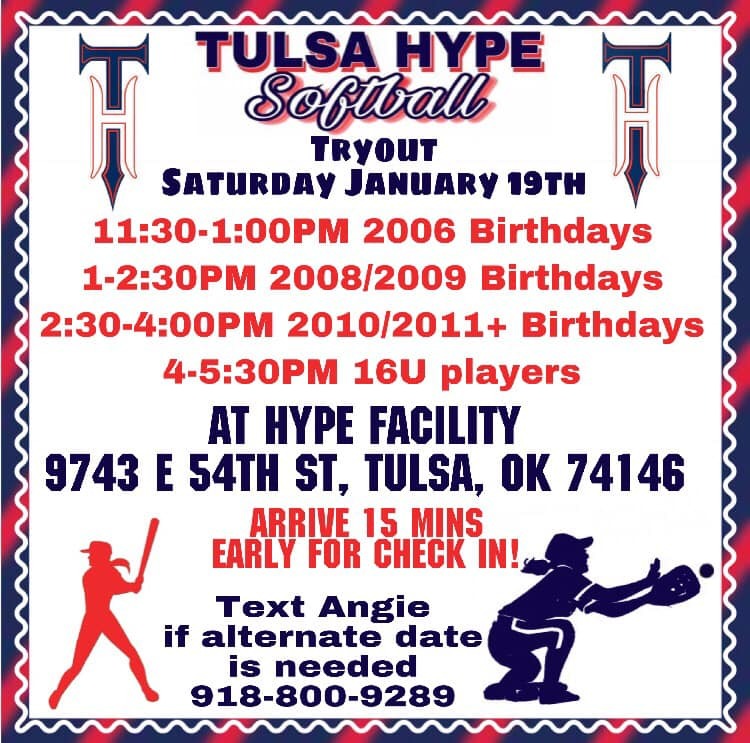 Tulsa Hype 08 is looking to fill remaining spots on our roster for Spring/Summer 2019. Seeking hard working and competitive team players who want to grow with a team. Dedicated, supportive, and team oriented parents are a must! We generally play 2/3 tournaments a month during spring/summer seasons. Instate travel and Out of State World Series travel is likely. Hi there! Are you still looking for players? YES! We are still looking for 1-2 players! Looking for a pitcher and another utility player! The Hype organization will be holding tryouts January 19th but you can text Coach Ross at 210-560-6307 to schedule a tryout before then! Rescheduled due to weather! TRYOUTS TOMORROW!